Tipsy is a free event-based tipping app that lets you pick winners during this Thursday night’s AWARD Awards for the chance to win $1,000 cash. Players select the pieces of work they think will be the most decorated, and score points each time their chosen work wins an award. 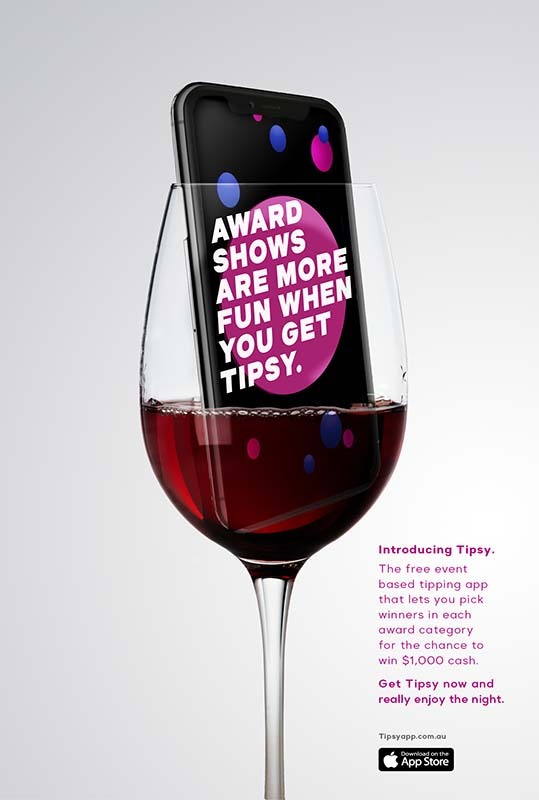 On the back of success at the B&T Awards in Sydney and Axis Awards in New Zealand, ‘Tipsy’ is set to give the AWARD Awards in Sydney this Thursday night some added excitement and fun. A live-leaderboard on the night will show each users total accumulated score and where they rank amongst other Tipsy players. Whoever ends up on top wins the cash prize. The comp is only open to those who attend the night’s event. “Tipsy is a genius addition to award shows. Even if the beers are warm, your dinner is cold, and none of your work wins anything, the night is still guaranteed to be fun,” says Brett Colliver, Creative Director at DDB New Zealand. “Tipsy’s a great way to make more of an award night, than just waiting for the results of the category you’ve entered,” says Tom Martin, ECD at Special Group Sydney. “Suddenly every result in every category matters to you because it’s all part of the game”. Created by Special Group Australia and Nakatomi, Tipsy is available for download on the app store now.